Balut is a game invented at the end of World War II by an American soldier lacking playing cards for playing poker. He was stationed on Cebu (the Philippines) and initially named the game Poker Dice. Years later, in the early 1970ies a Dane named Niels Lumholdt working for Thai Airways traveled to the Philippines frequently and picked up how to play the game but decided to name the game Balut when he brought it with him back to Bangkok, Thailand. The word "balut" in Filipino is the name of an unhatched duck egg and are sold by street sellers walking around screaming BALUUUUT. In 1979 Søren Milholt changed the rules of the game by introducing incentive points. Around 1997 a Dane living in the Philippines named Troels T. Carstensen added the Jackpot element to the game and Jackpot Balut was born. This ruleset is for the Balut game invented in 1979 by Søren Milholt. If you wish to play the game at home with friends or family you will need 5 dices and a scoresheet each. You can download a scoresheet for Balut by clicking the PDF icon below. After downloading the PDF file you can print as many copies as you want. You will need Adobe Acrobat Reader in order to view and print the scoresheet. The game consists of 28 rounds. In each round, you roll the dice and then score the roll in one of 7 categories. You must score 4 times in each category. This means that during the game, normally at the end, you may have to settle for scoring zero in some categories. If the total score in each category meets the requirement for that category (apart from one) you are awarded some points. One category is special, see the section on scoring below. The object of the game is to maximize your number of points. The game ends once all 4 fields in all 7 categories have been scored. You have five die, which you can roll. First you must roll all the die. After you roll all the die, you can either score the current roll, or re-roll any or all of the five die. To re-roll some of the die, select the die you wish to re-roll by clicking on them and push the "Throw Dice" button below the die. You can roll the die a total of three times -- the initial roll (in which you must roll all the dice), plus two re-rolls of any or all dice. After rolling three times, you must score the roll somewhere on the scoresheet. Once you have scored the roll, you roll again. You continue until all 4 fields in all 7 categories have been filled on the scoresheet, at which time the game is over. Once you have the dice face combination you want to score, you score the roll in one of the 7 categories. Once a field has been scored, it is closed out for the rest of the game; you cannot change a field's score once it has been set. Each category defines its own scoring rules, as described below. and score in the Sixes category, your total for that entry would be 18. This same roll would yield zero (represented with a line "-") if you scored it in the Fives and 4 if you scored it in the Fours category. you could score a small straight of 15. Again as in poker, a Full House is a roll where you have both a 3 of a kind, and a pair. Full house yield a score equal to the total number of eyes on all five die. Choice is the catch-all roll. You can roll anything and you simply total all the die faces values. you score 25 (5 times 1 plus 20). Points are also given for the number of Baluts rolled, each Balut is 2 points. 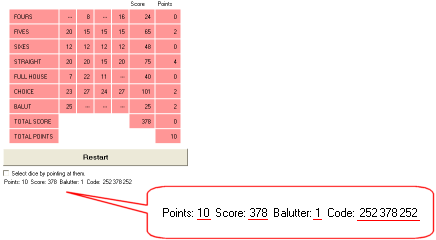 29 point is thus the theoretical maximum you can score. When you have finished playing one game a check code will appear below the scoresheet. If you wish to register your score you must take this information, points, scores, number of Baluts and the code and fill into the form below the scoresheet together with your name and e-mail address and a comment if you like. Dice is also extensively used in online casino games. To learn more about the subject and which casinos are good for playing, You can read their reviews here, along with a list of dice games that each of these sites offer for real money.